Take a day trip aboard a deluxe motorcoach to theaters, shopping excursions, sporting adventures and more. Gather your friends, colleagues, social groups, or come alone to experience the camaraderie of a group experience. ''Half the fun is getting there!'' and in this case it could be the short stops along the way, themes that are carried throughout the trip or simply some bonus excitement while on the bus. Janet Adams knows how to create unforgettable fun! On The Go Bus was established after working for a major hospital as their senior membership program and major event coordinator for nearly 30 years. Not only does Janet want to provide a memorable experience for her passengers but she plans to help support other small businesses in the area and along the trip routes. And just when you think you're getting that sleepy sensation on the ride, there will be a mile-marker door prize to make the ''Are we there yet?'' feeling fade away! 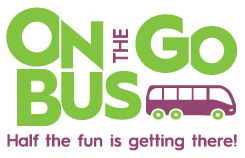 Sign up for email notices at janet@OntheGoBus.com or like and join this page www.facebook.com/groups/OntheGoBus/ to be the first to learn of upcoming trips and to reserve your seats before they are gone! Serving the Menomonie, Eau Claire and Chippewa Valley areas. One day and overnight deluxe motorcoach trips where Half the Fun is Getting There!